Description: One of these days, the Retro Belles will be the only thing you'll be able to find on the KCS. Shoot the gray power while you can. It's going fast. Description: KCS 3219 enter the main heading north now that the SB TXUX has cleared. Description: White ghost at the racks in Heavener. Description: Southbound manifest starts its run up Rich Mountain as it rolls through Page behind one of the few remaining white ghosts. Description: Arrived just in time to catch white ghost KCS 651 leading KCSH toward the racks in Heavener. Description: KCS 3219 in the Yard at Leesville, La. Description: Morning Picture of the KCS Gulfport Yard. 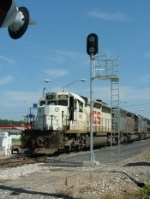 Description: KCS 3219 is being used as the yard switcher in Leesville. Description: Three gray six-axle KCS locomotive sit on the house track at KCS High Oak Yard. Description: KCS Train 100 entering the NS yard engine lite getting ready to pick up a cut of cars then head back south to Gulfport, MS. Description: KCS Train 100 comes aross Black Creek in the small town of Brooklyn. The KCS Dispacther gave this train a slow order of 10 mph due to high water coming arcoss. The Old Red Brigde to the left of the picture I believe was a part of Old Highway 49. Description: First run of the KCS Gulfport to Hattiesburg turn of the 2019 year. Description: Heading for home after seeing the Girlfriend in Hattiesburg before she went into work and i made a stop in Wiggins to catch this train.